It’s a spectacular drive up the Alaska Highway and not that far from cities in northern BC, Alberta and Alaska and NWT. If you live within driving distance and would like to come and pick up your Australian Labradoodle puppy…..we would love to meet you! Picking up your puppy in person allows you to see where your puppy was raised, meet us and have a one-on-one training session. If you live farther away, we can ship your puppy to you. Shipping puppies is very safe and puppies normally emerge from their crate wagging their tails after a nice sleep. We trust Air North to ship our puppies with ease to Vancouver, Edmonton, Calgary, Kelowna, Ottawa and Yellowknife. 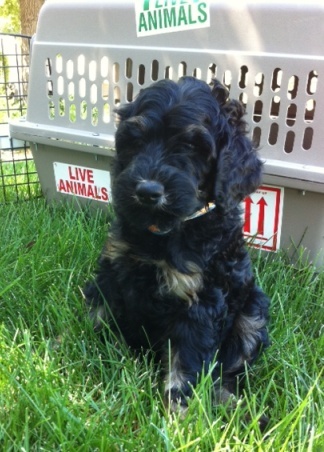 The cost of shipping your 8 week old puppy with Air North is included in the puppy adoption price. You’re able to fly into Whitehorse and bring your puppy back with you. Air North, Air Canada and West Jet all fly into to Whitehorse International Airport. We’d be happy to meet you and facilitate your puppy flying home with you. We may be able to fly with your pup and hand deliver him/her to you anywhere worldwide. The cost of this service directly reflects the cost of travel for us to come out to your hometown. If you live in the US, check out our sister program: ArborGate Labradoodles in Indiana (www.arborgatelabradoodles.com).